Handknit handspun socks+slippers, originally uploaded by earthchick. It’s November, which means it’s National Blog Posting Month, and, well, here I go. 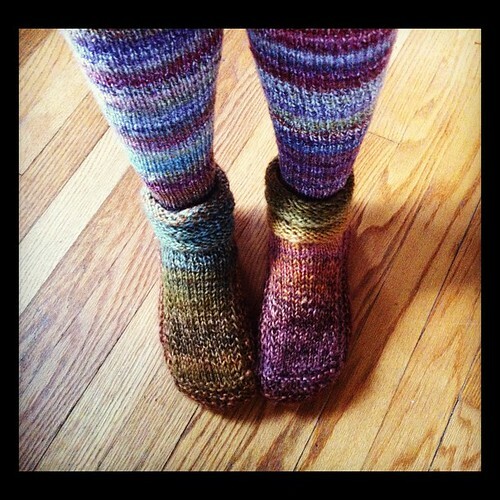 These are the handspun Mukluks I finished and showed you recently, and I have totally loved wearing them. They were easy to pack for my recent travels, and I loved having a yummy little piece of comfort while I was away from home. This blog has been a simple pleasure for me, too, and I’m looking forward to hanging out here more this month! These look so warm and cozy! Good job! I love that picture! You look so warm and the colors are beautiful!! !